Enchanting Rockwood Lakefront Home,Hot Tub, Boats, Privacy! Open Year Round! 4 Bedrooms, 2 Baths, Sleeps 10, Hot Tub, Fun and Sports Equipment for all! Reserve your getaway now for Spring Fun and Plan A Summer Week away now! Bring the Family,Friends, Kids, and Pets! Relax in peaceful private comfort on 1.5 acres on serene 100 acre Rockwood Pond and enjoy the Rails To Trails on the other side. The view out the full length deck across the lake will make it easy to fully enjoy the Great Room with Cathedral Ceilings, Skylights, wood stove, new appliances, Air Conditioning, and lots of seating and the Private Hot Tub under the Sun, Stars, Shade and Solar Powered Roof. 4 cozy bedrooms, (Queen) (Queen and single) ( Queen and single) and Expansive Family size sleeping loft/entertainment center with a King, 2 single beds,and hideabed, along with Two renovated full bathrooms, will accommodate all the family after a fun filled day around serene Rockwood Pond or hiking the Rail Trail right down the street. Very private and yet only 2 miles from the Town Green in so typically New England Fitzwilliam, NH. 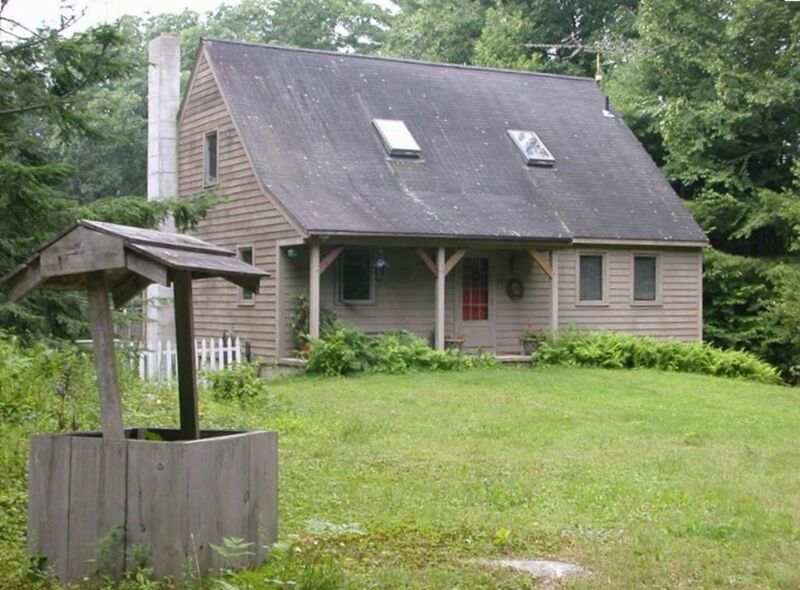 The Classic Saltbox style home with all the modern conveniences is very secluded, you can't see another home from the house or while enjoying the Hot Tub overlooking the Lake which is open Year Round!! In the summer we just rent from Sat to Sat as a minimum. The rest of the year is much more flexible. Step into your vacation retreat, drop your bags and gaze out the wall of glass to crystal clear Rockwood Pond down the gently sloping lawn and pathways with numerous wildflowers, blueberry, raspberry, blackberry and strawberry bushes galore. Your secluded level beachfront with dock and big floating swim platform makes it very easy to start your vacation explorations. There are very interesting rock formations from an old granite quarry that closed 100 years ago, or have a campfire in the fireplace of the old Stone Cutters cottage by the lake with our abundant firewood. We also have another firepit up by the Hot Tub and house. After swimming, fishing, and exploring with the big canoe,3 kayaks ( one a double! ), 4 person paddleboat and other fun toys, it will be the perfect end to the day to sit on the expansive deck, grill dinner, take a soak in the hot tub, and renew relationships with friends and family with a game of Ping Pong or Pool. Enjoy the games, current books, magazines, DVD library. It's great for a family with young children with a full ent center with 2 TVs, VCR,DVDS, and Broadband Wireless DSL computer with printer and speakers. The full modern high ceiling sunny lower level has a new full Bathroom, Queen and single bed with a Ping Pong table, Pool Table, Full sized poker table, fishing gear, games, life jackets, winter sports equip, art supplies and other fun things to do. We do ask our guests to bring their own bed linens and towels and will give you a complete list. We have lots of pillows, quilts, blankets etc. In the 2 car garage are adult and kids bikes, strollers, kids cars & toys, badminton, volleyball, soccer,croquet and other sporting equipment. Rockwood Pond has well spaced seasonal homes on only one half of it's almost two mile length. From Sept to June only 5 homes are occupied and in the summer the other 20 are primarily used on weekends only. Half of the Lakeshore is a 'Rails To Trails' pathway for walking, bike riding, nature watching,picking blackberries, or hiking over to Mt. Monadnock, the most climbed mountain in the world, for a 100 mile view to downtown Boston. Very often on nice weekend days, you might catch some sort of performance in the small natural amphitheater on the top! The Changing of the Seasons from late spring has abundant strawberries, the summer brings raspberries and big blackberries and as you head to fall, the loads of plump blueberries will amaze you. There are all sorts of festivals, antique shows, theatre in nearby Peterborough, NH (The 'Our Town' of Thornton Wilder) and special presentations at the Fitzwilliam Museum which is housed in the old town doctors home, unchanged for over 150 years. Keene, about 12 miles away has a very active downtown with about 70 shops , restaurants, concert hall etc, all locally owned and the national chains on the outskirts. 6 miles away in Rindge you can get Walmart, Market Basket, Tractor Supply etc in Sales Tax Free NH ! After your time in this quiet corner of Southern New Hampshire, you head home refreshed, renewed and dreaming of your next visit!! Make sure to look at our unedited comments from previous guests just below! We have the most positive reviews of ANY property in New Hampshire! Keywords: Open Concept Home on 1.5 Acres,hottub,lakefront, swimming, privacy,boating, kayaking, canoe,kayak,fishing,hunting,rope swing, kids, pets,snow shoeing, XC sking,Peace and Quiet! We own another home on Forest Lake VRBO # 24790 in Winchester, NH and love the area for all of its cultural, artistic, theatrical, and usually free activities. The peace & privacy of Rockwood Pond are very relaxing. There is excellent berry picking right on the property and a level waterfront with all the boats, paddles and lifejackets and winter sports gear to fully enjoy it! Peace & Privacy,Lots of Lake fun, wildlife viewing,great fishing, hiking on the level Rails To Trails or up Mt Monadnock, The most climbed Mtn in the World. Fantastic Fall Foliage, Terrific fishing, XC skiing, ice skating or snowmobiling on marked, groomed trails, or head off trail for some extreme riding and gliding! Solar Powered Home! Only 25 homes on Rockwood Pond. 20 of them are summer weekend only, so from Sept to May , you own the lake! Check out the 250 yr old Fitzwilliam Inn from Wed to Sun for entertainment and fine dining. There are also two breakfast and lunch places, The Flipside grill and Chef Alan's place. Sandy bottom starts off about 6 inches deep and gradually gets to 6 feet deep about 40 feet out. Interesting rock formations from the granite quarry that closed 100 yrs ago. Private level waterfront with Sandy shallow entry into lake. lots nearby from slow moving streams to challenging rapids. Our 1.5 acre property past the blueberry, strawberry, raspberry and blackberry bushes. Very gradual entry into the sandy bottomed crystal clear lake with big dock and swim platform. Mountains surround Rockwood Pond and only 8 miles to Mt Monadnock, the most climbed Mtn. in the world! Easy 2-3hr climb and on a clear day, see Boston, 100 miles away. You can see it from the lake. Step right into the sandy bottom of Pristine Rockwood Pond or take out the 3 kayaks, big canoe or paddleboat or just float around on inflatables. Also most cell phones work at the house except AT& T is a little dicey. Best reception on back deck. Modern oil fired forced air and Vermont castings Wood stove with glass door. Plenty of well seasoned wood for stove and both firepits. Outdoor near waterfront for S'mores and Campfire songs, Interior woodstove with glass door. Additional outdoor firepit near Hot Tub. Sporting Equip, bikes both adult & kid,XC skis, skates, hockey sticks, snowshoes,kids riding toys, in modern 2 car garage and furnace room. Wooden Zamboni down by the lake to make a rink! Vermont Castings, In the Great Room with plenty of seasoned wood and a stone firepit down by the lake! It will keep the upstairs at 70 when it's frigid outside and it's easy to light and use. in Kitchen, spare 'Beer fridge and freezer on lower level. Lots of Spices, Condiments, some baking supplies. 1 flat screen, 1 large regular TV, both with DVD, one also has a VCR..
Lots of jigsaw puzzles, games, playing cards, for all ages. Riding toys in garage along with a number of bikes. A bunch of recent classic movies and a lot for the kids. Full of Blueberry, Blackberry & Raspberry bushes. 2- Single kayaks, 1- double Kayak, Big Aluminum Canoe, 4 person paddleboat with all the Life Jackets, paddles for kids and adults. 10 sets of Cross country skis, boots and poles, from kids to adults. About 10 pairs of ice skates and a couple pairs of snowshoes. One step up from ground to main level, 36" wide doors on main level, can drive to level waterfront area. Hot Tub under the stars overlooking the lake is open year round! We enjoyed our stay here, the wood stove was an added bonus for the evenings. The view of the pond was beautiful! They had plenty of board games for the evenings which was fun! Since it was off season we didn’t use any of the outdoor equipment although they offered plenty. The hot tub was very relaxing. Sorry, The water got low on the hot tub which makes it act funny, I wish you had called and it would have taken 10 minutes to fix. The dryer works fine , you had it set on fluff, no heat. At least you got to enjoy an extra day for free that we gave you. Hope that you'll come back and leave the house in better shape than you did this time, as my cleaning lady was not happy! Paul and Anne's place was absolutely perfect for our lab's retreat! Not only was the place a great fit, but Paul was great to communicate with throughout the process and had lots of helpful info for us to help make the stay as pleasant as possible. Great place for a Winter Getaway ...with Everything!! together to enjoy the wood stove and swap stories while looking out the big windows towards the lake. We thoroughly enjoyed sitting in the Hot Tub under the stars while it was snowing... what a contrast! We went cross country skiing on the lake and the Rail Trail right next door. We can't wait to try it out in warmer weather also! We'll be back! My friends and I have been renting this house annually for almost ten years now for our annual WinterFest gathering. The owner has always been accessible and gone above and beyond to assure that we enjoyed our stay. Our numbers have ranged from eight to fifteen and we've always found the many sleeping options to our liking. The loft offers some privacy for sleeping, but still allows for being included in the overall house activities. There are two bedrooms for more privacy and the downstairs sleeping area/game room is a great place to relax and not have to listen to the upstairs hustle and bustle. Or, you can put the kids down there for ping pong, pool, games, and sleeping. If you want to create a separate kids space, this is ideal. The hot tub was clean and clear, and BBQing on the spacious deck, directly off the kitchen, is great for grilling and chilling. The kitchen is outfitted with everything that you could possibly need. We do a Saturday steak night, then follow that with a big Sunday morning breakfast for all. There's lots of room and the open concept allows for a great "hang out' space. We keep the wood stove going round the clock and there's a well stocked wood pile right out front to the right of the front porch so you don't have to lug the logs. There's also two fire pits outside with circle seating. One right off the downstairs sliding door and hot tub, and the other down by the water, where there's a great tree swing too. We have already booked our next WinterFest for February 2020 in this house and would highly recommend this rental for all size families or groups, you won't be disappointed. Only 8 Miles to Mt Monadnock- The most climbed mountain in the world! See a great view of it halfway across the Lake. 12 MI to Keene, NH on Rte 12 always lots to do, eat, shop . 19 miles to Peterborough, NH, The 'Our Town' of Thornton Wilder fame and a very active arts, antiques, culture and theatrical center. Only 2 miles to downtown Fitzwilliam with a museum, antiques shops, the Fitzwilliam Inn for a classic New England Dinner. Real privacy on the property and yet so close to so many activities. In the winter with only 5 homes on the lake occupied, unbelievable quiet and stunning amounts of stars! Please add 9% NH Tax to all rates NH Tax ID # 054224 No Pet charge, $95 Cleaning fee. Heavily discounted Long Term Stays especially Dec 1- May 1- Please Inquire! No large parties with non guests. No Smoking in the house. Principal guest must be 25 yrs old or gain approval.